I have never in my life seen a real green egg until now. I always thought Dr. Seuss' "Green Eggs and Ham" was a metaphor. On the contrary! 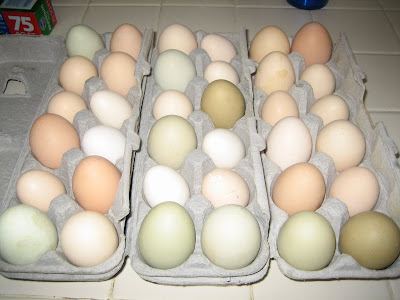 We were having a yard sale last weekend and someone we met told us where to get real fresh eggs. I'm thinking brown at this point. Being egg lovers, we drove about 3 miles in a direction that we have never been and purchased 3 dozen. Now when the lady opened the cartons to show us, I became very skeptical of eating what I saw. THERE WERE GREEN EGGS! I know that most of the family is from the country and knows about the fresh eggs. I'm 38 years old and this is the part of life that I embrace, when new and exciting things are discovered. I feel like a KID seeing this for the first time. I'm all giddy! And to add to my happiness is the fact that these eggs are by far the best I have ever tasted. I'm still skeptical about the green ham. I have kept chickens that laid blue eggs. Which also apparently have no cholestoral!